FYI: a group of us have created a new group on the DeviantArt site specialising in superheroine transformation art. Whether you're into female hulk-outs, magical power-ups, or the good ol' fashioned phone booth striptease, hopefully you'll find something to your taste at the new group. We've been running a week and already amassed quite a collection of artwork, cosplays, 3D work and photomanips, and there's lots more queued up waiting for approval. So why not drop by and check us out; and if you're a DA member don't forget to sign up or watch us to ensure you don't miss a single pic. Sorry to have to ask this....but...looked at your pictures. Is the idea of women in transformation who put on total masks-ie rip off there face like halloween masks really a big thing? seems a touch odd to me. castor wrote: Sorry to have to ask this....but...looked at your pictures. I suppose you're talking about the full costume rips from JohnnyHaradrim mostly. Johnny is something of a friend of mine and costume ripping is kind of his thing, his main character American Mom is pretty much a flying brick with super disguise skills linked the ability of morphing her body to fit any disguise. I don't know how big a thing it is, but it's how he rolls. As Woodclaw indicated, there's a very prolific (and talented) artist on DA by the name of JohnnyHaradrim who specialises in these types of whole-body disguises. Essentially they are Supergirl-type transformations, but with face masks instead of glasses and/or a wig. We're a pretty broad-minded bunch at the group, and we let in pretty much anything that is superheroine based (so no she-wolves or 50 foot women) so long as it isn't overtly pornographic. Johnny's work easily qualifies, and we're proud to have him contribute. He's easily (in my opinion) one of the best practitioners of classic comicbook style art on DA. I don't share his enthusiasm for full body disguises to the extent that he does, but clearly there are many who love them enormously. And he's not the only DA artist who does work of this type. 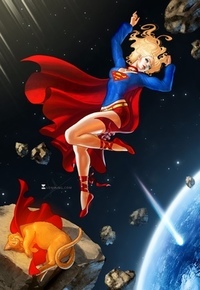 So long as their pics are about superheroines, they are welcome at the group. Sorry for bringing it up-it does look good art, and i think overall you have put together something pretty great Red. Your a talented artist and i always love your enthusiasm. Well as a co-founder of this place is my time to say a pair of things. Yup sure Haradrim art is a little different and will have some that like, me included, and others that not, which is not any kinda problem for sure so no worry for share your thoughts with us. And for what Monty says yup we have to get OK from artits but anyway anyone member or no could help us with galleries submiting original or comissioned art if there's a mutual agreement with the one that made it and of course who asked for it. As also if got an DA account even not posting anything as i do then can go onto any piece that would fit. click on Submit To A Group and choose ours. If all goes right would be added onto the right folder asap as would be done. Unless I'm mistaken, if you submit an artist's work to a group, the artist has to approve before the work gets submitted. Yup that's it, first when we choose a pic have to be right tested from the group itself and then by artist who decides to include it or not. For comissions of course both parts have to agree with fact of been show to public in general. TwiceOnThursdays wrote: Unless I'm mistaken, if you submit an artist's work to a group, the artist has to approve before the work gets submitted. Yep, both the work's owner (or at least, the DA member who is hosting the work) and the group mods have to give permission. That means that if the owner submits their own work then the group mods have to approve it, if a moderator submits the work then the owner has to approve it, and if someone else submits the work then both ownder and mods have to approve it. I've set the group up (for now) so that works submitted by group members are automatically approved by the mods, but non-members have their work voted on by the mods -- so membership has its benefits. (Obviously we can remove any work after the event if it doesn't fit.) This means that if you are submitting your own work and you are a group member, it will go through into the galleries straight away.